Kings River Float Trips near Noel, Missouri. Scenic Kayaking on The Kiamichi River in Southeastern Oklahoma. Add some zipLines, climbing wall fun and forest adventure to your float trip with a visit to Loco Ropes Treetop Adventure Park in Mountain View, Arkansas. Great Float Trips on Beautiful Ozark Rivers Abound in Arkansas, Kansas, Oklahoma and Missouri. Elk River Canoeing and Kayaking in Noel, Mo is an Ozarks river that is very close to Oklahoma. The Buffalo River near Harrison, AR offers countless float trip opportunities, see outfitters list below. Take your camera on the Middle Buffalo River, take your sprayskirt on the upper Buffalo River! The White River has it's confluence with the Buffalo River near Mountain Home, Arkansas. It is well worth paddling when you are in the area. The Buffalo National River is one of the best smallmouth bass streams in the state of Arkansas. During warm-weather it is a breathtaking canoe stream paddled by many, but in winter it is nearly deserted. It offers enough canoe camping to get anyone back-to-nature. This crystal clear river runs over colorful gravel between beautiful limestone bluffs. The river is lined with dogwood and redbud trees that come alive with fabulous color both in the Spring and Fall Canoeing seasons. The Buffalo River, located in northern Arkansas, originates in the Boston Mountains of the Ozarks, flows for over a hundred miles before joining The White River. 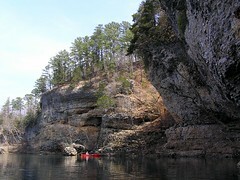 It is officially a national treasure and locally considered to be a great Arkansas Kayaking trip for Oklahoma folks. The upper section is in the Ozark National Forest and it is managed by the U.S. Forest Service. it also has the most exciting rapids and is designated as a National Scenic River and a National Wild River. The rest of the river is simply heaven for canoe paddlers. The Oklahoma Flatwater paddlers lead at least one trip down this river every year and OKC Kayak even offers guided Buffalo River adventures. Nothing cools you down faster than a spring fed river or a crisp clear lake on a hot Oklahoma day. Check out our Oklahoma Canoe and Kayak Paddling Page to learn more! You can read about our most recent float trips on our Kayak Oklahoma Blog. Be it canoe or kayak, we like nothing better than sliding across the water on 'our own steam'. How can something this much fun actually be good exercise? To introduce Faithful Son to this healthful and enjoyable sport, we planned a float trip via canoe on a small part of The Buffalo River in near Gilbert, Arkansas. One thing that surprised us all was the gravel. In my muddy Oklahoma hometown area, gravel is a rare and precious resource. We mistakenly wore sandals to paddle this lovely river, but we saw no sand. The Buffalo River is a beautiful river of crystal clear waters and gravel banks surrounded by high limestone bluffs of purple and orange. In 1972, it was designated by Congress as America's first National River, on the 100 year anniversary of the birth of Yellowstone as our first National Park. Find a Spray Skirt for Your Kayak. It is also just across the Arkansas border from Oklahoma, only a few hours from Tulsa. In the Fall and Spring the Buffalo River offers breathtaking seasonal color. Take your camera...heck take your tripod too on this wonderful river! The Buffalo is the last major undammed river in Arkansas and is wonderfully pristine, yet well complimented with canoe and kayak outfitters in the surrounding small towns like Ponca, St. Joe, Yellville and Hasty. We have used both Silver Hill Canoe Rental and Buffalo Camping & Canoeing and I can honestly say they were both first rate. They offer numerous float trips depending on distance you want to travel. The river is categorized into three parts, the upper, middle and lower. Click the links below to see our list of outfitters for each section of the Buffalo River. The large town in the area is Harrison, Arkansas and offers many fine restaurants, shopping, hotels, motels, cabins, cottages, etc. Sadly, I'm afraid the Buffalo River float trip failed to convert Faithful Son from XBox to paddle junkie as it rained steadily for the majority of our float. Dianne and I were paddling away on the river, so we found the rain to be a cool and refreshing crowd control device, but Dylan darn near froze in the middle of the canoe! Oh well, better luck next time, eh? Thankfully, Gilbert, Arkansas is close enough to Tahlequah to allow us an afternoon float trip down the Illinois River on our way back home. Shuttle services and rental of canoes, kayaks, & rafts. Closed for the season as of Sunday 6/26/2011. Cabins, campsites, shuttle services and rental of canoes & kayaks. Floating Season is March to June. Guided trips, luxury cabins, shuttle services and rental of canoes, kayaks, rafts & horses. Shuttle services and rental of canoes, kayaks, rafts & tubes. Open all year. Cabins with Jacuzzi, shuttle services and rental of canoes, kayaks, rafts & tubes.